Östersund ([œstɛˈʂɵnd]; Southern Sami: Staare) is an urban area (city) in Jämtland in the middle of Sweden. 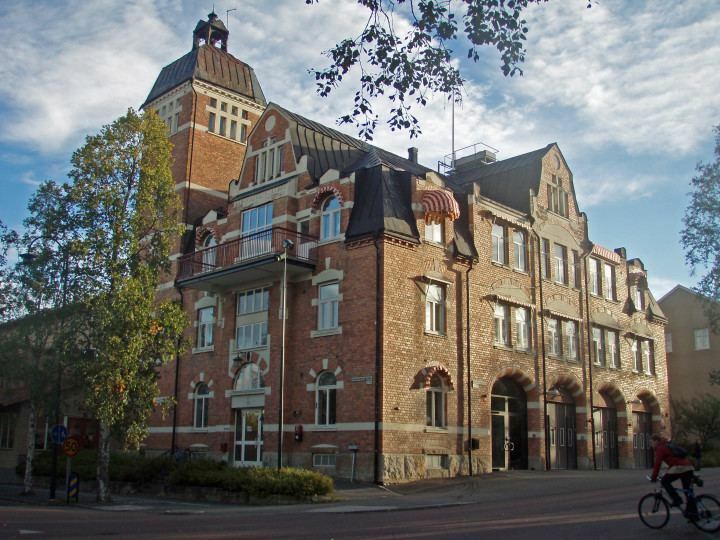 It is the seat of Östersund Municipality and the capital of Jämtland County. Östersund is located at the shores of Sweden's fifth largest lake, Storsjön, opposite the island Frösön, and is the only city in Jämtland. Östersund is the region's cultural and economical centre and by tradition a city of trade and commerce. Östersund had one of the most extensive garrisons in Sweden prior to its closure in the early 21st century. The city is the Mid Sweden University's largest campus site with approximately 7,000 students. 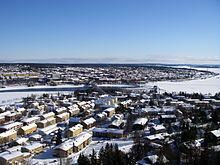 With a total population of 44,327 (2010) Östersund is the 24th most populous city in Sweden, the 46th most populous city in Scandinavia, and by far the largest inland city in Northern Sweden. Östersund is marketed as Vinterstaden — Winter City. Winter City as a project is run by the Municipality together with city enterprises. Östersund has had a long history as a centre of outdoor activities with a modern cross-country ski stadium and an actual piste in the city itself. Östersund has also hosted several World Championships in various sports such as biathlon, speed skating and ski orienteering along with Swedish National Championships in cross country skiing and snocross. The city has been the applicant city of Sweden for several Winter Olympic Games, but has yet to host one. The precursor to the Winter Olympic Games, the Nordic Games, were however held at several occasions in the city, due to lack of snow in Stockholm. Östersund has a high exposition of sunlight and was the most sunny city in Sweden in the summer of 2007 (July 1 - August 9) with 654 hours of sun. However, in comparison to east coast locations, sunshine is relatively low. The buildings along Storgatan (literally: "the great road") with entire segments intact since the 1880s are considered one of the best preserved city settlements in Sweden. The wooden façades are rich with details and the house are relatively low, short and slim. A great amount of work was put down on creating a balance between details and entirety. Parallel with Storgatan lies Prästgatan — "the priest road", Östersund's main shopping street. The buildings between the two roads are often connected and the roads create small rooms mostly inaccessible for keen winds. These so-called rooms also stimulate the social life on the streets. Stortorget — the main town square in central Östersund is one of six "closed squares" built in Sweden, the others being the ones in Uppsala, Karlstad, Vimmerby, Piteå and Haparanda. It was created through indentation in four different blocks to deliberately create an open air room with openings to every direction. A style deriving from how cities were planned during the Renaissance. However the town square lost its original shape when it was "opened up" and expanded towards the lake. Stortorget has long been the city's main market place and core, it is also here that the thousand year old market Gregorie market is held each year in March. The city festival Storsjöyran has Stortorget as its main centre. The central parts of Östersund are a part of the urban district Staden — "the city", which has become synonymous with Östersund for many people living in the nearby villages and towns. As Östersund is the only city in the area and nearest city for many it is common to call it Stan, though the dative form Staa has increasingly grown unusual. The residents of Östersunds are referred to as östersundare, though local ruralists call them stassbon "towners", and stassbo "towner", in singular. The large church is a monumental feature in Östersund's cityscape. It is a basilica made of bricks with clear distinguished aisle. The quire is three-sided and the large steeple is facing the west: Storsjön and the fells of Oviken. In 1758, the plans were brought back up through an initiative from the chief financial officer Pehr Schissler and the proposition did however initiate a new debate whether or not a city was to be established in Jämtland, in order to counteract the trading and faring traditions of Jämtland's farmers. Several other attempts at constraition had previously been taken, and deemed unsatisfactory. Östersund was founded and given its charter by Monarch Gustav III of Sweden on 23 October 1786, shortly after the outskirt of the Odensala farmers' lands were bought for the purpose. Several other places had been suggested, like Huså the then-largest settlement in Jämtland along with Krokom, Sunne and Ede outside of Brunflo. Frösön was also a candidate but the lot fell on Östersund, as it was deemed most favourable. The only thing actually located in the area at the time was the main road and the bridge to Frösön. Östersund was upon foundation freed from taxes during a 20-year timespan and completely liberated from trade regulations and guild order. In other remote locations of the Nordic region, similar cities were founded, like Reykjavík on Iceland the very same year, Tromsø (1794) in Northern Norway and Tampere (1775) and Kuopio (1782) in the Finnish inland. Östersund is however the only city in present-day Sweden to have been founded in the 18th century. Just like any other city founded by state officials miles away, the city developed extremely poorly and had to struggle in its infancy. The State tried to pursue the Jamtish traders on Frösön to migrate to the new city but they had no intentions of leaving such a rich parish with fertile soils Frösön consisted of in favour of the swamp and marches across the strait. During its first 50 years the city's population only grew (on average) with eight people per year. The city did become the capital of the newly founded county consisting of the provinces Jämtland and Härjedalen in 1810, meaning that a county residence was built and a county administrative board was located to the city. Though Östersund remained as a de facto farmer village with less than 400 inhabitants in 1820. An upswing occurred in the 1850s, as trade was liberalized and the logging process developed. It took until the construction of the railroad in 1879 before Östersund became a real city and actually gained the status as Jämtland's centre, at Frösön's expense. Thanks to the "farmer chieftain" Nils Larson i Tullus the railroad came to pass through the city itself instead of outside it, as planned. The railway from coast to coast across the then union between Sweden and Norway was finished 1882, connecting Östersund closer to Trondheim and Sundsvall. Östersund then came to grow faster than any other Swedish city. After ten years it had passed 20 Swedish cities in population. 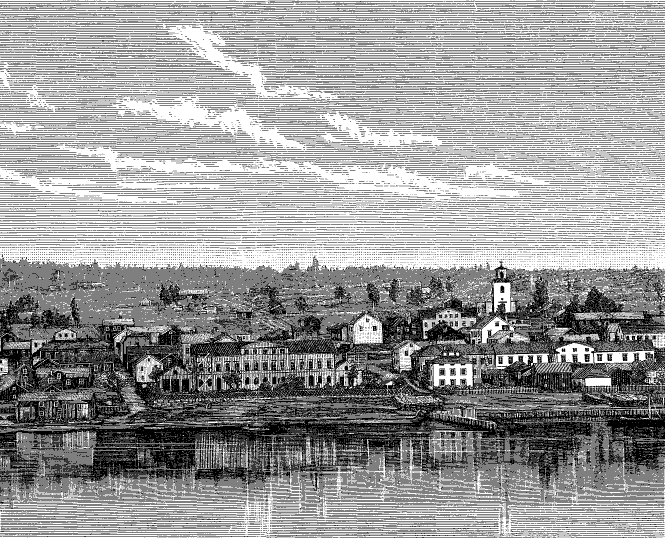 The city attracted immigrants, a slight majority from the Jamtish countryside, though still with a high number of settlers from Southern Sweden. While Östersund was in its most intense state of growth popular movements emerged among the inhabitants. In Jämtland and Härjedalen the free minded Good Templar movement (a part of the temperance movement) came to dominate completely. In 1883, 700 of the city's total population of 3 000 were organized Good Templars. The greatest symbol of the movements grandeur was the Order House constructed 1885 in the city, Östersunds-Goodtemplars-Ordenshus. When one of the most prominent leaders, Joseph Malins, visited the city he announced that it was the world's largest order house. Many of the leading people behind the popular movements in Östersund saw industrialization as a significant threat towards the native districts and the old village and farmer community. The work from the movements made the city and its centre-right governance extremely rejective towards industries. Instead they wanted to portray Östersund as a centre of out-door activities, culture, education and tourism. Industries were not allowed to threaten the good environment, and the social history traditions. In 1917 when the Great War was fought on the continent and with the February revolution in Russia, starting the Russian Revolution also affected Östersund. Rationing led to lack of supplies and a revolution was feared. Some of the citizens, primarily soldiers, went on hunger strikes and at the first of May that year 4 000 demonstrators gathered in front of the city hall demanding lower prices on milk and wood. The year after the Spanish flu spread like wildfire across the world. The city doctor in Östersund noted that "Östersund ought without objection have been more haunted by the flu than any other Swedish city", which is why Östersund was referred to by locals as spanska sjukans huvudstad, "capital of the spanish flu". Despite the great depression and several crisis resulting in a very high unemployment rate Östersund continued to grow in the interwar period. The municipal community Odenslund was incorporated into Östersund in 1918. The business world remained largely unaffected and Östersund continued being one of the least industrialized cities in Sweden. Instead Östersund continued to focus on wholesale trade and became a centre of this in northern and north central Sweden. The city's central position was strengthened when Inlandsbanan was constructed through Jämtland from the north to the south. During the interwar period the car and the bus became common. The first scheduled bus route was created in the 1920s between Östersund and the nearby town of Brunflo. In the next decade well over 40 bus routes were functioning in Östersund. The dairy was located west of the bus square, Gustav III:s torg, at the shopping mall Kärnan's current whereabout. This square naturally become a central part of the city. Östersund continued to grow after the Second World War. Lugnvik was incorporated into the city in 1954 and Östersund was just like the rest of Jämtland affected by the Rehn-Meidner-model, though not in the same way. The Swedish Keynesian politic was launched in order to improve the mobility of the labour force. Jämtland was struck hard by this when the people moved from the countryside to cities, from inland to coast and from the north to the south. As an urban area Östersund was affected by the Million Programme and urban districts like Körfältet were created. The negative view towards industries were changed when the Social Democrats came to power for the first time in the city's history in 1952. Industries were enticed to Östersund through the national localization politic and industrial areas were created in Odenskog and Lugnvik. The development wasn't, as already mentioned, as good in the rest of Jämtland as it was in Östersund and as a counter act towards the governmental politic the Republic of Jamtland was established in 1963. Östersund became the republic's "capital" and the home to the freedom festival Storsjöyran. Östersund continued to grow and in 1970 Frösö köping was made part of Östersund. In the year of 1971 a major reform occurred in Sweden creating large municipalities replacing all the older institutions and the new large municipality was named after the city. Just like in the rest of Sweden the public sector greatly expanded at this time. In 1960 the public sector of Sweden constituted about 30 per cent of Sweden's total gross domestic product, in the middle of the 1980s the number had grown to 65 per cent. At the time it was here the jobs were, in the county board, the state and in the new municipality. The main reason for the large expansion were the expanded transfer payment to the households that occurred, along with growing interest and public consummation. Everything was founded by large tax raises. The entire 1970s was an expansive period. Besides the new industrial complex the Frösö bridge was constructed, a new police house, Z-kupolen (burned to the ground in 1989), Storsjöteatern, Folkets hus, urban district churches, malls etc. The County Administration board and the hospital expanded and large housing estates were constructed in Körfältet, Lugnvik and Odensala. The city tried to acquire a "humanistic college of higher learning" on Frösön already in the 1940s. A large tension existed between the cities in Norrland and Umeå left the struggle victorious 1962. Östersund however required a "social college of higher learning" in 1971. Östersund is since 2005 one of the main campus sites of the Mid Sweden University (Mittuniversitetet). A number of governmental offices have also been located to the city in recent years. Östersund became a garrison town when the Norrland Artillery Regiment A 4 was founded in the city 1892, followed by the upgrading of Jämtlands fältjägarkår to Jämtlands fältjägarregemente I 23. This was done with the growing fear of a Russian assault whereas Jämtland-Trøndelag and Norrbotten became the most prioritized defense-regions. The dissolution of the union Sweden-Norway contributed with enhancing Östersund as a military city strengthening its presence, the Field Ranger Regiment I 5 was located in the city 1910 and the Jämtland Air Force Wing F 4 came to Frösön 1926. Östersund is the capital of Jämtland County and thus, the county governor Britt Bohlin Ohlsson reside in the city. Bohlin Ohlsson is the head of Jämtland County Administrative Board (Länsstyrelsen i Jämtlands län), an administrative entity appointed by the Swedish Government. Östersund is also the seat of Jämtland County Council (Jämtlands läns landsting, located on Frösön). The County Council is the elected assembly of Jämtland County. The County Council's responsibilities lie primarily within the public health care system and transportation between the municipalities. Östersund is the seat of Östersund Municipality (Östersunds kommun). The legislative body of the municipality is the 67-member municipal assembly (kommunfullmäktige), elected by proportional representation for a four-year term. The assembly appoints the municipality's main governing body, the 15-member executive committee (kommunstyrelsen). The executive committee is headed by the Mayor (kommunstyrelsens ordförande). Östersund has historically been dominated by the Conservatives, the freeminded (later on Liberal People's Party) and the Social Democrats. Though contrary to Sweden on a national level Östersund's centre-right parties long remained in majority. The situation changed first in 1952 when the social democrats were included and they received an own majority in 1962. In 1966 the agririan and rural Centre Party entered the scene, along with the minor Christian Democrat and Communist Parties. A new centre-right government was appointed and the Centre Party became the largest party in that coalition 1970. However, since the 1980s the Social Democratic Party has been in power (excluding a term in the 1990s) supported by the communists (now simply Left Party) and occasionally the Green Party (entered in 1982). Jens Nilsson from the Social Democratic Party is the mayor of Östersund and has been so since 1997. The airport is situated 11 km (7 mi) outside the city core, on Frösön. Åre Östersund Airport (previously named Östersunds flygplats) is an international airport and the ninth biggest in Sweden with roughly 390 000 passengers 2005. The airport is one of few Swedish airport with incoming foreign charter traffic and the only one with considerable economic growth in that sector. Östersund has also railway communications. Norrtåg operates Mittbanan from Storlien to Sundsvall. Inlandsbanan runs in the same direction as Inlandsvägen. Östersund is connected to Stockholm, Gothenburg and Malmö through long distance X 2000 (high speed trains), InterCity and night train. Local company Stadsbussarna i Östersund (literally: the City Buses in Östersund) has nine routes in the city. Like the rest of Jämtland Östersund is heavily dominated by many small businesses. The city is the centre of trade and commerce in Jämtland County and has well over 300 different shops. The retail trade's turnover is 30 per cent higher than it ought to be, given the number of inhabitants the city has. Trade in the central business district (Staden — the City) is mostly concentrated to the shopping and pedestrian street Prästgatan where large local shopping malls such as Kärnan and Mittpunkten along with department stores such as Åhléns are located. Large clothing companies such as H&M, Lindex and smaller like WESC etc., approximately 50 restaurants, shoe stores, sporting goods retailers like Stadium and Intersport, several supermarkets (Östersund has rather few convenience stores) and much more. Storgatan, the street that runs parallel with Prästgatan is also lined with shops, restaurants and coffeehouses. Unlike Prästgatan this street is not a pedestrian street. Östersund is the city in Sweden with the most square metres of window display per capita. The most prominent figure in Östersund's business life throughout the 20th century was the car salesman (started out selling horses) Sven O. Persson, founder of Persson Invest, Byggelit and Bilbolaget. Nowadays the most distinguishing businessman is Maths O. Sundqvist, owner of several real estates in Östersund, including the entire urban district Stadsdel Norr through his real estate company Fabös (together with Peab). Östersund has had a long history as a marketplace with the already mentioned ancient Gregorie market, tracing its lineage back to the 11th century, in early March. However banned in 1914, it continued to be held a couple of years. In 1950, the market was reborn shortly and was completely resurrected in 1986, when the city celebrated its 200th anniversary, and has been held yearly since then. In 1948, when the markets were non-existent visions to restore Östersund's market traditions, in a modern version, were brought up. The result was the trade fair Expo Norr, initiated 1950 in order to strengthen Östersund as the leading the centre of trade in the northern parts of Sweden. The trade fair is an annual event just like Gregorie market, though Expo Norr is held during the summer and not during the winter. Expo Norr is usually attended by 30 000 individuals every year. Besides trading and public services Östersund has some larger companies such as Solectron, Cybercom, Svenska Dagbladet's customer service, Volex, Husqvarna AB, Swedbank's telephone bank and Telia. Companies such as the dairy cooperation Milko and Inlandsbanan AB have located their corporate headquarters in the city. A national survey done by the Confederation of Swedish Enterprise show that out of every company in Östersund Municipality 52 per cent are "very positive towards globalization", thus ranking Östersund at number eight in Sweden as the most globalization friendly Municipality. The city has many cafés, bars, pubs and nightclubs. The city has a long café tradition, as they were important early on for the rich association life that came with the popular movements. It was natural for visitors from the countryside, the military and tourists to spend time with each other and the towners at a café. At one of the city's cafés the sandwich cake is said to have been invented. Östersund is the cultural centre of Jämtland County and home to the prize winning museum Jamtli. The museum has both an enclosed exhibition area and an outdoor area which contains a number of historical buildings from all over the county, depicting the old lives of peasants, the early city of Östersund and the Scandinavian inland herding. The museum exhibition hosts an interesting set of tapestries, the Överhogdal tapestries, showing a rich imagery of both Norse and Christian origin from the Viking Age. The mythical Storsjöodjuret (Great Lake Monster) has an exhibit of its own. Another remnant from the Viking age is Frösöstenen, one of the world's most northerly rune stones located on Frösön, the island of Freyr. Lake Storsjön has been trafficked for a long time and the steamships S/S Thomée and S/S Östersund are still in operation every summer. Contrary to most boats, they are seen as males and not females. S/S Thomée is however the only one that sets sail from Östersund's harbour. S/S Östersund set sail from Arvesund, located at Storsjön's western shore but makes visits to Jamtli's steamboat jetty. Frösö Zoo is one of Sweden's largest zoological gardens with exotic animals. It has roughly 700 different animals like Siberian tigers, lions, polar wolves, monkeys etc. Frözö Zoo also has a tropic house, a biological museum and an amusement park. Outside of Östersund in the village Orrviken there's a Moose Zoo, called Moose Garden allowing close encounters with tame moose. Färgfabriken ('the colour factory') is a culture experimental centre based in Stockholm, that perceive itself as a laboratory of contemporary art. A branch named Färgfabriken Norr has as of late been established in Östersund and has hosted an "at large" exhibition of Östersund at the New World Bank-conference with Noreena Hertz, Kjell A. Nordström and Malcolm McLaren. Gamla Tingshuset, Holds a small cinema, a café, a small venue and practice halls. It is usually a meeting place for the town youngs. The city festival Storsjöyran (referred to as simply Yran, literally meaning: The Great Lake Giddy Festival), the oldest city festival in Scandinavia and with 55 000 visitors every year the largest in Sweden. Storsjöyran is held in the middle of Östersund the last weekend of July. Although the event starts the weekend before with the opening of "Krogstråket" when regional bars and restaurants gather near the lake. The Winter Festival is the name for all the events that took place during the Biathlon World Championships 2008. It included a festival of light, live music, new school skiing at the town square, a film and photo festival, a festival arena and more. It will be hosted again 2010. The largest daily newspaper in Östersund is Östersunds-Posten (ÖP) with a circulation of 30 000 copies and the second largest is Länstidningen Östersund (LT) with a circulation of 15 000 copies (2006 for both). Like most Swedish newspaper they each have a political editorial page, views of the Centre Party are expressed in ÖP and views of the Swedish Social Democratic Party are expressed in LT. Länstidningen is unique in Sweden, as it is the only Swedish newspaper with press support that has ever made itself non-dependent on state subsidy. Much of the paper's success is ascribed to the then editor-in-chief awarded with the great journalism award. Since 2006 the newspaper has been dependent on state subsidy. The media group Mittmedia has owned both newspapers since 2005. The city has several secondary schools (gymnasieskolor) whereas Palmcrantzskolan (PC) and Wargentinsskolan (Wargen) are the two largest. Among the smaller are Primrose, John Bauer, VTC-gymnasiet and Östersund's gymnasieskola. Östersund is marketed as the Winter City and has a long history of winter sports. 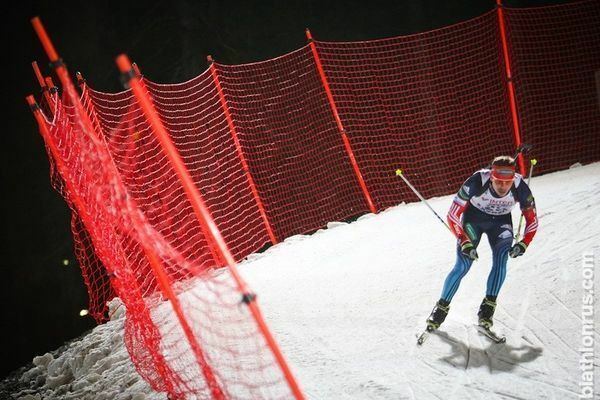 It is internationally perhaps most known as one of the regular Biathlon World Cup hosts and was also hosting both the 1970 and 2008 Biathlon World Championships. The cross-country ski stadium is located two kilometres (1.2 miles) from the city centre and is one of the most well-equipped and spectator friendly ski stadiums in Sweden. The stadium is also internationally renowned due to the topography of its ski tracks, the compact track-system and the fact that Östersund is usually quite a reliable locality for snow during the winter months. A number of biathlon world cup races have been held at the stadium as well as several national championships in cross-country skiing. Östersund, in association with the neighboring municipality of Åre, had plans to be the candidate of Sweden for the organization of the XXIInd Olympic Winter Games, the 2014 Winter Olympics, but the candidacy proposal was rejected by the government. It would have been the fourth attempt of this city (after 1994 where Östersund lost the bid with the score 45-39 to Lillehammer in the final round, 1998 and 2002).